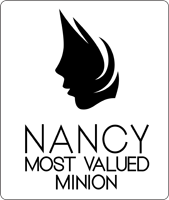 The Nancy Most Valued Minion Award is a designation awarded to those who have proven themselves to be truly exceptional members of the Nancy community. Whether it's providing support on the forums, Jabbr room or Stack Overflow, providing a multitude of pull requests, or just helping with ideas, the Nancy MVMs have shown they we well and truly on board the Super Duper Happy Path! Unfortunately we're not able to offer our MVMs large amounts of expensive software, or free conferences; but they do have our gratitude, and the rights to use this awesome badge on their blogs! Unlike other similarly named programs you may have heard of, the lack of thinly veiled bribery in the MVM program does mean that our members can be relied upon to provide impartial advice and support, even suggesting when Nancy may well not fit your needs.